Join us Saturday, June 8th, 2019 for a fun-filled journey across the heart of Wisconsin. This one-day trip will allow tractor owners the opportunity to take in the beautiful countryside while showing off their passion for tractors. 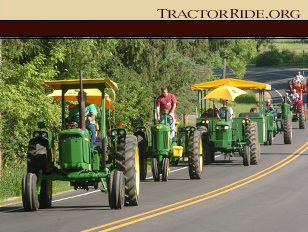 The 14th Annual Wisconsin Midstate Tractor Ride will be a one-day event leaving out of Baraboo and returning to Baraboo. The staging area will be the Badger Steam and Gas Club grounds, S3347 Sand Rd., Baraboo, WI and we plan on leaving for the ride at 8:00 a.m. If, after the ride, you want to stay in the area there are many area motels to select from. Or if you bring your camper, you will be able to stay at the Badger Steam and Gas Club grounds. One of the special events we will be attending is the Sauk County Dairy Breakfast. Hosting the event this year is Mel & Doria Lohr, S9591 Chruch Rd., Prairie du Sac, WI. We are asking for a $10.00 donation to be given to charity. No application is needed, just show up and enjoy the ride! Note: Gale & Nancy Getschman retired in 2018 as coordinators. for your own safety). Additionally, every rider needs to be in their own safe seat!